The 20th right whale mom was recently spotted on the calving ground off the coast of Florida by our colleagues at the Florida Fish and Wildlife Conservation Commission! 20 females with calves is good news for a population with just over 500 individuals. What's even more exciting is that the most recent mom, #1334, has been giving birth consistently for 30 years. This is her 9th calf making her the most productive mom in the population! 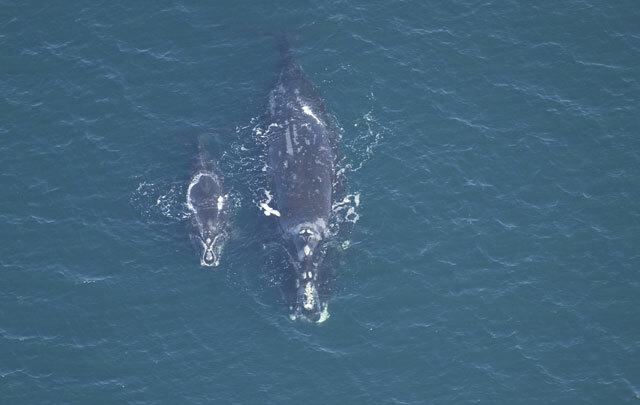 #1334 is the most productive North Atlantic right whale mom in the population! In 1989, #1334 took her calf way north to the Labrador Basin—an area that is rarely surveyed and where few right whales have been documented. She is only seen in the years that she gives birth and we suspect that she spends the rest of her time in areas far from shore—and hopefully far from the dangers of fishing gear and vessel traffic! Read about this mom and her 8th calf in this 2009 post.